A Pterygium is a wing-shaped pinkish in-growth from the conjunctiva onto either side of the cornea, which is usually found on the nasal side. The conjunctiva is transparent and covers the white sclera that forms the eyeball. The cornea is the central transparent round area that covers the black pupil and coloured iris. A pterygium has a rounded apical “head” advancing toward the cornea centre and a triangular “body” of thickened conjunctiva. It is situated on the outside of the eye and can be seen with the naked eye. It must not be confused with a cataract, which is an opacification of the normal lens inside the eye. A cataract can only be seen with the naked eye when it is far advanced. The normal black pupil will then have a grey/white colour. A pterygium occurs more commonly where people live outdoors much of the time, and are exposed to wind, dust and particularly ultra-violet rays from the sun. There may also be an inherited disposition to the formation of pterygia under suitable conditions. The pterygium may be a protective “callous” in response to a “dry eye” condition. Symptoms are variable. Initially there may be some discomfort with the recurrent redness and occasional pricking or gritty sensation. The cosmetic appearance may be the reason for seeking advice. Pterygia are normally symptomless, although, when already bulky, a coincident conjunctival injection may make them turgid and uncomfortable. The vision becomes increasingly affected as the axial area of the cornea is invaded. Only when very extensive do they encroach on the axial area of the eye and impair vision, or mechanically interfere with eye movements. Their tendency is always to grow centripetally, especially in those that are vascular and fleshy. Pterygia must be removed if their inward growth threatens to impair vision. A pterygium is completely adherent to the surface of the cornea and can only be removed by surgery. It can not be removed by laser surgery. 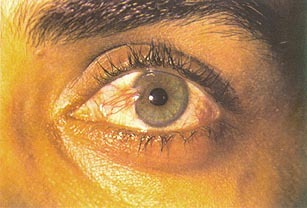 Recurrence is fairly common for a pterygium after removal. Various kinds of eyedrops and sometimes radio or chemo therapy is used post operatively to help prevent recurrence. This does not mean that the pterygium is a type of cancer. These are only ways of preventing a recurrence. is done under general or local anaesthetic. The patient goes home the same day, it is not necessary to stay overnight. Post operative drops and/or ointment will be given. The eye might be red, swollen and irritable for 1 month after the operation. In this period it is not necessary to keep the eye covered with a pad. It must however be protected from wind and bright sunlight. Usually sunglasses with a proper ultra-violet tint are sufficient. Reading and writing might be uncomfortable for a couple of days after the operation.